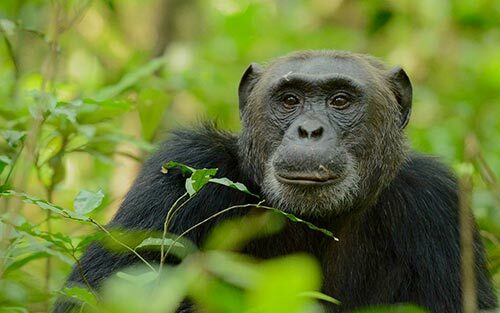 Experience some of Uganda’s best highlights and view its exceptional wildlife on this 8-day Uganda Primates Jungle Safari. Start off in the Kibale Forest, as you head into the jungle in the company of chimpanzee researchers, to observe these intelligent, emotional and acrobatic primates in their natural habitat, before travelling through the famous Queen Elizabeth National Savannah Park and continue on to the mighty Bwindi Impenetrable Forest and go on an enchanting gorilla trek to find the mountain gorilla. 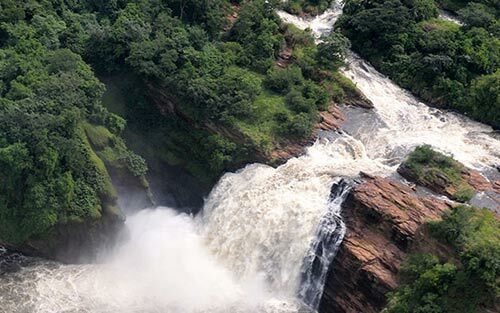 Then absorb the stunning landscapes and people of Uganda as you drive through the western region of this magnificent country. Big game, dazzling birdlife and dramatic scenery, dotted with traditional villages. Upon arrival at Entebbe International Airport you will be met by a member of the Naturetrack Expeditions team who will transfer you by road to your hotel. After breakfast, the Uganda Primates Jungle Safari guide will drive you west toward Fort Portal to the Kibale Forest. Traveling on both asphalt and unpaved roads, you pass through traditional Ugandan Villages where you see people at work tending their traditional crops of millet, sorghum, beans and maize. The lush rolling hills of this region provide good “photo opportunities” and keep your eyes open for birds such as the beautiful Black-headed Gonolek, Fan-tailed Widowbird, Double-Toothed Barbet, Long-Crested Eagle and some of the numerous Sunbirds and Weaver birds that perch on the fence rows and power lines near the road, as you approach Fort Portal in the foothills of the Rwenzori Mountains, you enter Uganda’s famous tea plantation region. A carpet of green spreads before you, as far as the eye can see, and seems an unusual contrast to the countryside through which you have just passed. You arrive at Fort Portal, then, continue toward Kibale Forest ONE OF THE GREAT African rainforest research reserves. Years of study by scientists (who have cut a grid through the forest) have habituated many of its animals to human observers. This forest is famed for the variety of primates found here and it is a terrific area for birds. 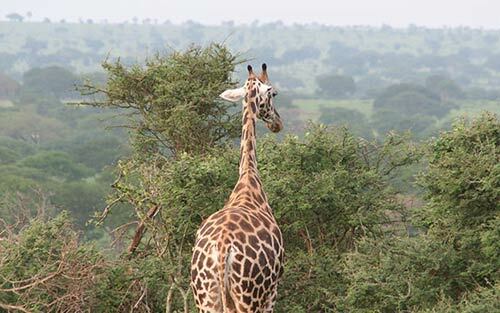 Kibale Forest National Park is one of the best safari destinations in Uganda. The park plays host to 13 primate species including the red colobus and L’Hoest’s monkey. The most accessible of Uganda’s major rainforests, Kibale’s major attraction is its chimps. Tracking these noisy apes as they squabble and play in fruiting trees is a thrilling experience. 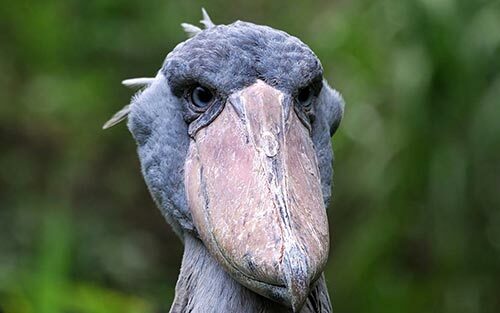 There are also 335 species of bird here and other rare animals including the forest elephant and the giant forest hog. Gorillas are all very well, but chimpanzees are their raucous, misbehaving cousins ready to show off at the drop of a hat. Head into the forest at first light. Depending on where the chimpanzees nested the night before, it may take anything from ten minutes to over an hour to reach them – sometimes longer. Silhouettes of chimpanzees appearing in the trees as troops forage and explore is mesmerising, but the pant hoots and calls between troops of up to 60 individuals is when the hairs on the back of your neck stand up. If playing Tarzan for the day appeals, then all day chimp trekking can be arranged. Depending on what time the Uganda Primates Jungle Safari party return, the afternoon can be spent relaxing at the lodge, or exploring the nearby crater lakes and villages. TheUganda Primates Jungle Safari driver/guide will drive to Bwindi via Queen Elizabeth National Park. The drive passes through Fortportal and then south along the eastern length of the Rwenzori Mountains (Mountains of the Moon) with the hope of seeing the glaciated peaks, gently descending into the Great African Rift Valley to Queen Elizabeth National Park and continuing to Bwindi Impenetrable National Park, passing Ishasha area of the park with the hope of seeing the famous tree climbing lions and through the scenic area known as the “Switzerland of East Africa”. Continue on to Bwindi Impenetrable Forest, where you cross the equator, through scenic open savannah, dotted with giant Euphorbia trees and traditional villages. Covered in thick tropical rainforest and often shrouded in mist, Bwindi provides a perfect habitat for mountain gorillas. Spread over a series of steep ridges and valleys it looks the part and having survived the last ice age is considered one of the most diverse forests in Africa. The birding here is big and colourful, the forest dark and inviting and the sense of adventure palpable. The Impenetrable Forest of Bwindi National Park is certainly aptly named. On its steep slopes and in the deep valleys, the largest of the primates has managed to escape extinction. Report at the park office at 7.30am for the gorilla tracking. Carry a picnic lunch and plenty of water. Cameras and plenty of fast speed film is recommended. It can rain at short notice; hence waterproof clothing is a good essential including zip lock bags for cameras and film. Meeting ourUganda Primates Jungle Safari ranger guides, gorilla watchers head off the steep, trail-less slopes to search for gorillas. In addition to the gorillas, you may spot many birds, red-tailed and ground-dwelling L’Hoest’s monkeys. 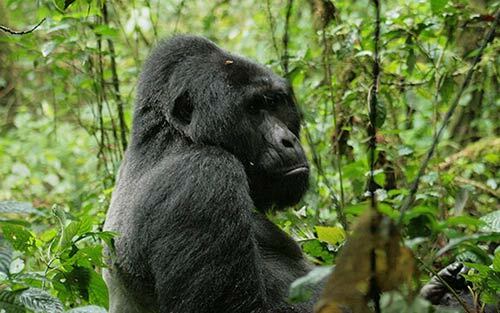 Although park rangers try to keep tabs on the whereabouts of the gorillas, they are free ranging wild creatures and can be difficult to locate. Sometimes finding the gorillas can be easy, as they may have remained close to the area where they had been feeding the previous day. Sometimes they require constant tracking, which can be arduous. Some of the difficulties to be encountered can include steep, muddy slopes, stinging nettles, safari ants, and rain. 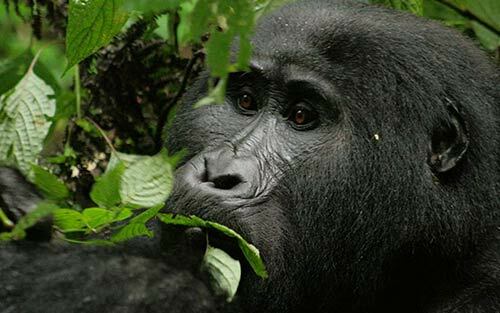 The reward is an extraordinary opportunity to observe the gorillas at close range. 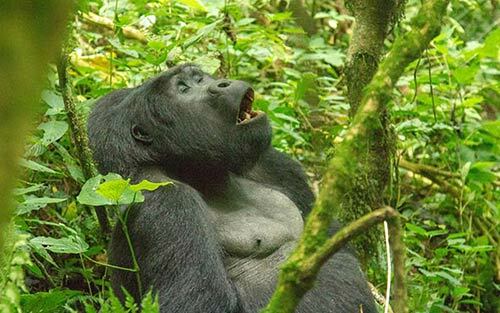 The gorillas are not tame, but they have been scientifically habituated to accept the presence of quiet and non-threatening observers. The park rangers will brief you on appropriate behavior. You can expect to stay with the animals for about an hour after first encountering them. However we can‘t guarantee you’ll see them but chances are 98%. If your group size is less than six members, the park rangers will add other trekkers to your group. You have no way of knowing who these trekkers will be or what physical condition they may be in, and our group will need to trek together. 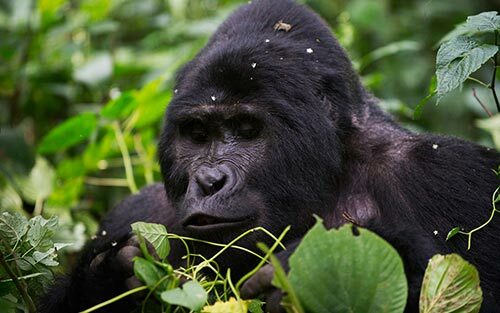 Should your gorilla trekking end early, rainforest walks in Bwindi can be arranged. Other wildlife you may encounter includes yellow-backed duiker and a variety of birds. Meet the indigenous group of people the formerly lived in Bwindi Impenetrable Forest before it was gazetted as a national park. 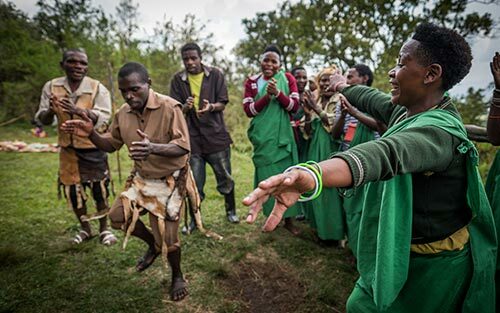 Rich in culture and exuberant, the Batwa short people will teach you their culture and have you engage in cultural activities that will leave your mind rich with new cultural experiences. After the cultural experience, you’ll head back to your lodge and chill back to relax or visit the nearby villages for more cultural experience. After breakfast depart for Lake Mburo National Park. En route, you pass through Uganda’s Ankole District where the people keep massively horned cattle, which have been bred in this region for centuries and are used as an indicator of personal wealth. The horns of these domestic beasts may measure well in excess of four feet each. Small children tend their herds, making sure that the cattle don’t invade the fertile fields and banana plantations that dot the countryside. We continue to Lake Mburo National Park, a small park surrounding a lovely system of lakes and papyrus swamps. 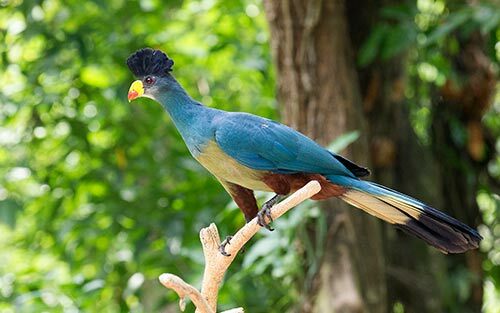 Mburo offers perhaps the best opportunities in Uganda to see birds associated with acacia woodlands, such as the Bare-faced Go-away Bird, Black-bellied Bustard, Black-headed Gonolek, Grey Hornbill and Cinnamon-chested Bee-eater. 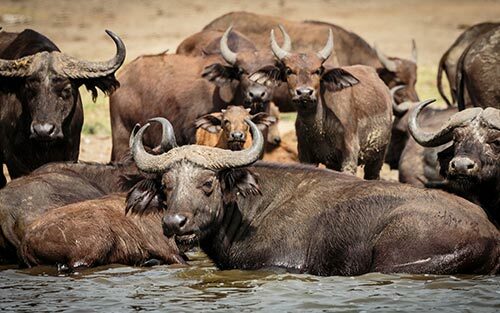 The only large predators here are Spotted Hyena and Leopard, but the park is home to a large variety of ungulate species, including African Buffalo, Topi, Uganda Kob, Oribi, Reedbuck, Klipspringer, Defassa Waterbuck, Common Zebra and Eland. This is the only place in Uganda where Impala are found. Nile Hippo and Crocodile are also fairly common in the park. You will view game as you leave the camp for Kampala, pass through the town of Masaka near the shores of Lake Victoria, then continue through huge papyrus swamps, fragmented rainforest, with a stop at the equator and the Mpigi Royal drum makers and witness how drums have been made in Uganda for centuries. Long before the coming of the Europeans, the Baganda people had a highly structured society and drums were used extensively for long distance and rapid communications. Best time to visit Uganda. 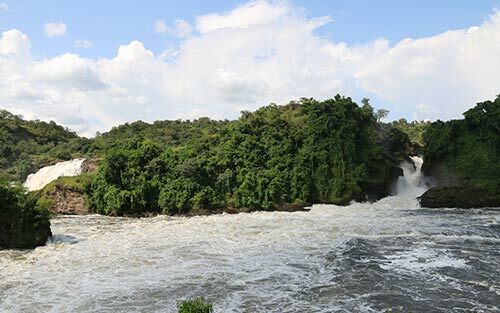 The best time to visit Uganda is pretty much all year round. The country straddles the equator so there are no true seasons, although March to May an October to November are wetter – which can be less pleasant for gorilla tracking.